Both the screen size and PPI have their use. But your example isn't exactly perfect either. If PPI is the most important thing for your photo viewing, then why don't you use 10" 720p screen? 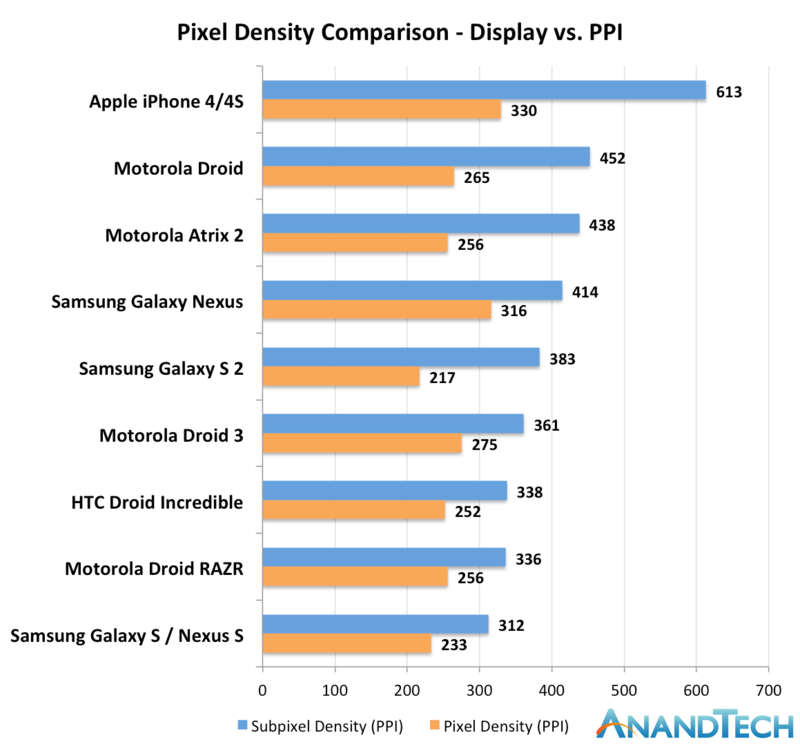 What I'm trying to say is that of course PPI is important, but screen size is equally important. You can't easily separate the PPI needs based on usage. Both are closely related. For me, as long as text looks crisp enough at their intended usage distance then I would choose the bigger screen even if it means sacrificing PPI. Of course for portable device (laptop, cellphones, etc) the size consideration is one of the priority when choosing the device. When I'm choosing my laptop, I have a target size. For example: when buying laptop, the first thing I choose is the size. I want a 12-13inch because the screen isn't too small and it's still portable enough. Sure, I can choose those 10" screen for extra PPI, but the screen would look too small. Anything bigger than 13" would be too big. Now, if there is a choice between 13" 720p vs 13" 1080p then of course I would choose the latter as long as the price is within my budget. Like the current iPhone screen situation. A lot of people wants bigger screen. They don't really care if the bigger screen would reduce the PPI, they just think that the current screen is too small. It also tends to be ignored that the screen is not just a screen for you to look at. It is a touchscreen. An input device. Certainly screens bigger than 3" are more usable than those that aren't (remember 2.8" Touch Pro?). Can we all agree on that? The upper bound on usability is where you can no longer use the phone one-handed to dial. I'd argue that the experience improves gradually all the way up to 4.3 or more, where it drops off sharply. Even bigger than that when they remove the hardware buttons like they did on this phone. That's not true because too close it's impossible to focus. It depends what you do. If you read a lot on your phone, then high pixel density really does make the text crisper and that much easier to read. To take a realistic example - text on my iPad (under normal reading conditions appropriate for the device) is still at the point where jaggies can be seen on the diagonal edges of letters like X. Text on an iPhone4 is no longer at that point, those jaggies are not seen. This is precisely the reason why those individuals who primarily use their iPads as eReaders care so much about when iPad will get a high-res screen. Sub pixel numbers give one some insight into how much better a screen will be in this respect because nowadays everyone uses some sort of subpixel optimization for their text rendering. I don't know if the metric Anand uses in the second graph is perfect for this purpose, but it's probably acceptable. Everyone, when they see text on an iPhone4 screen, says "wow". I'm unaware of that sort of reaction from any of the current crop of AMOLED screens. By any standard the iPad is better for reading than the iPhone. You will fit more text on the display (because of the slightly higher resolution) and the bigger size will make it easier to read. The downside is that it doesn't fit in your pocket. The reason we care about pixel density is to approximate paper ever more closely, resolution-wise. 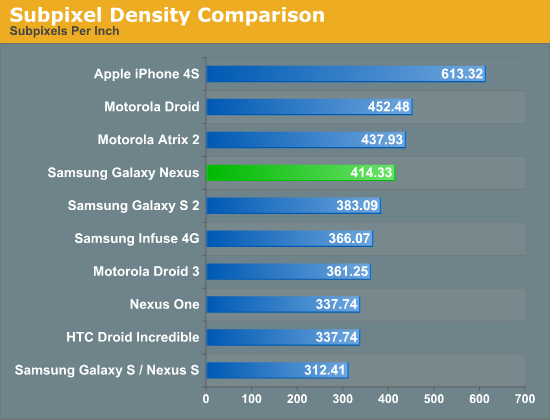 Higher pixel density means cleaner graphics, nicer typography, and less need for antialiasing. 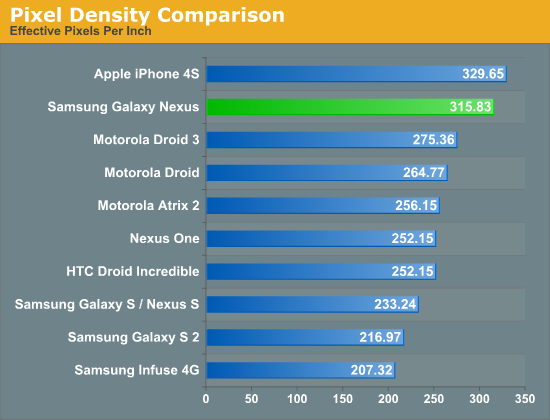 Ummm I care about the pixel density, I care a lot. 800x480 on the Titan looks freakin awful. 800x480 on a 3.7 inch screen looks quite nice. 'why do we even care about these charts? The answer is that with Pentile you aren't getting full pixels. Each pixel is effectively Red, Blue and HALF a green (shared with the next pixel).